Selecting the appropriate printed circuit board assembly partner is a challenging prospect when faced with hundreds of options across the globe. Making the right decision is vital for achieving the most accurate representation of your prototype as well as cutting cost and meeting tight deadlines. 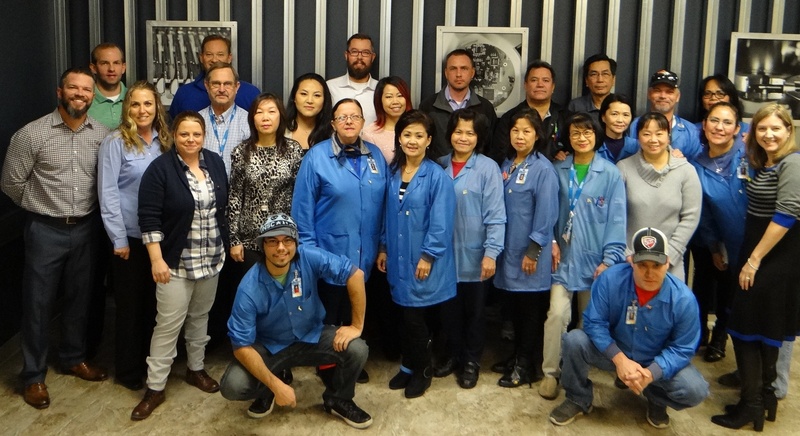 For example, the group of employees in the picture above represent nearly 500 years of manufacturing experience. The resource below will help guide you in selecting the right PCB assembly partner. Start-up companies are great when it comes to developing new mobile apps, but a lack of experience can be detrimental when assembling complex printed circuit boards. In fact, using an inexperienced company often means project delays, many unnecessary questions and boards that need multiple rounds of rework. Below are some important items to consider when determining how important experience is to you. Fast PCB assembly helps engineers get their finished products done on-time. But just how quickly can you expect to have your completed boards? As a general rule, in today's world of automation you can get any size order assembled in a fraction of the time it would normally take to assemble by hand. In fact, many circuit board assembly providers have standard turn-times of five days or less, with some, like Advanced Assembly, offering 1-day turns. Your PCB assembly partner of choice should be able to provide you with monthly quality / performance metrics. Ask for these metrics to better understand if you projects will be delivered on-time and error-free. For example, Advanced Assembly closely tracks on-time performance and defect percentages. Our on-time performance is 96% or greater. This is exceptionally high considering the company’s quick-turn focus and standard turn-times. In comparison, other companies claiming a quick-turn service typically have an on-time performance of 90% or below, if they track it at all. Defect percentages are calculated by looking at parts shipped vs. parts returned for defects. Our monthly goal is < 2% defect, which we consistently meet or beat. Our performance in this area is 2 to 3 times better than other companies in the business of delivering quick-turn prototype PCB assemblies, a fact which is a source of pride for our teams! Does your PCB assembly partner stand behind its work with a warranty? If not, you may want to look for other options. For example, Advanced Assembly has an unconditional warranty, which says if Advanced Assembly makes a mistake, the company will make it right regardless of time limits. There are so many different factors to consider when selecting PCB fabrication and assembly partners, especially in today's global economy. Yet, making the right decision can make the difference between the success or failure of your electronic project. Read this article for additional criteria to use when evaluating PCB partners.